Like I said, I love my cats and they really are the most loyal animals ever – if you give them plenty of attention, that is. Remember this cheap and cozy cat box? 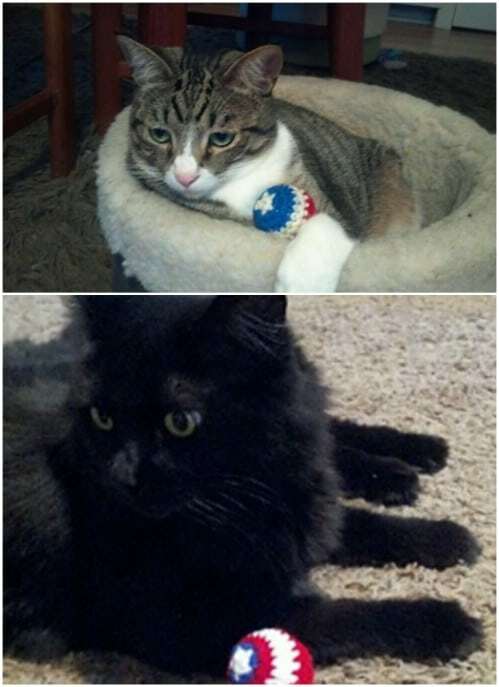 That was the first DIY I did for my kitties and they loved it. 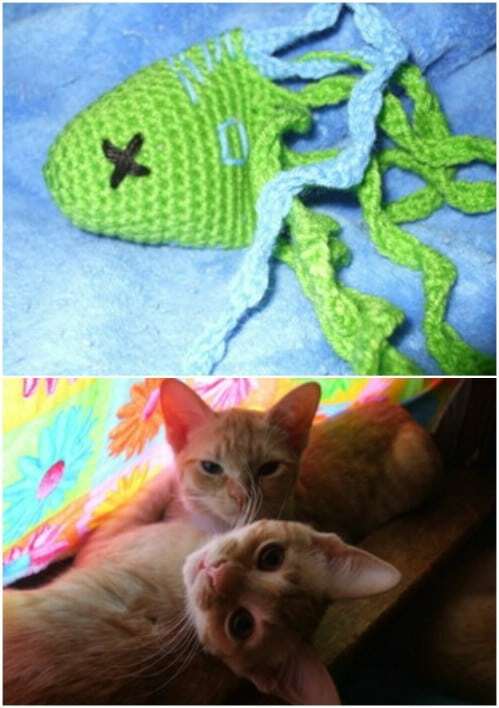 Now, I’ve found some amazing crochet projects that not only let you satisfy your cat’s wants and needs, they give you some amazing practice with those basic stitches. Crocheting is one of my favorite pastimes and when you combine that with crafts to make my cats happy, well it just doesn’t get much better than that. From alien toys to catnip mice and so much more, there is a toy or bed or other project in here that your cat will love. These are also projects that you will love because they are all so very easy and easy is what we love, right? Don’t get me wrong, I love my dogs as well. In fact, these 25 frugally fun dog toy DIYs were dedicated to my little pooches. 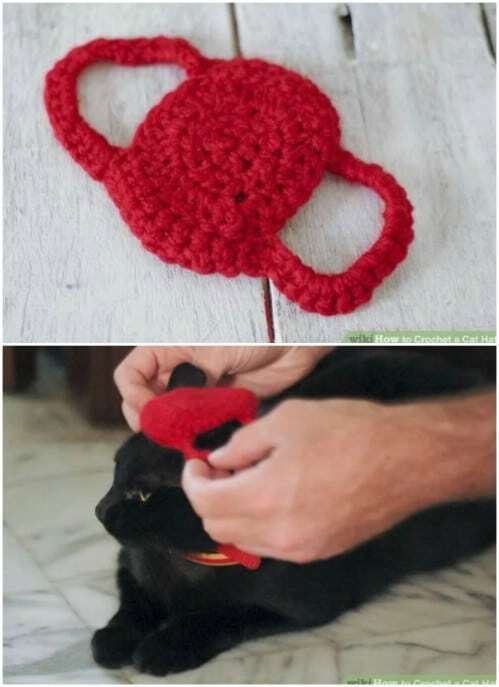 That said, I think the cats got jealous so I decided to find some wonderful ways to keep our felines happy and I think this crochet collection will do it. Whether you crochet on a regular basis or this is your first time holding a crochet hook, these projects are going to prove easy and fast. Most of them can be worked up in an hour or less and all of them are going to add some wonderful fun and excitement to your cats’ lives. 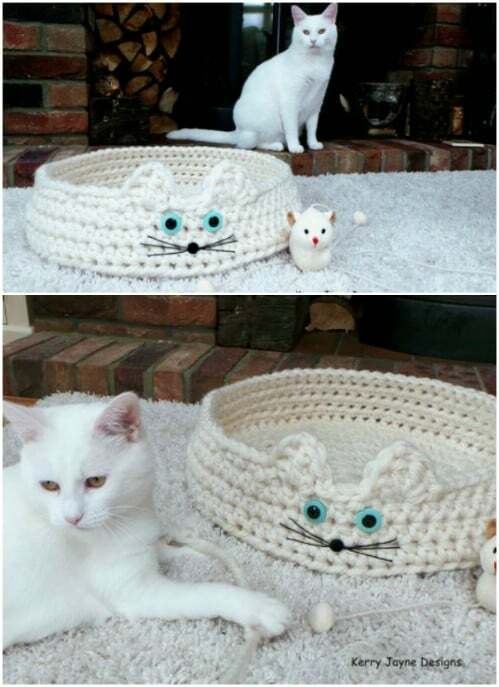 Take a minute and gather your supplies and let’s get started creating some easy and fun crochet projects for our kitties. The kitties will thank you! Give your little furry family member his own alien with this easy to crochet toy. Seriously this little alien is just too much fun and your cats are sure to love it. I found this pattern on Etsy – it’s under $4 – and it looks like such an easy project to crochet. You only need to know basic stitches and even if you miss a stitch or two, your little kitty is still going to adore his little alien friend. This little toy not only gives your kitty something to play with, it’s easy to crochet and it lets you use up an empty toilet paper roll or two. The stitching itself is really simple and the end result is an amazing toy that your kitties are going to adore, right down to the little jingle bells hanging off the bottom. This is a really unique toy – given the toilet paper roll – and something that you’ll be able to complete in about an hour or so. 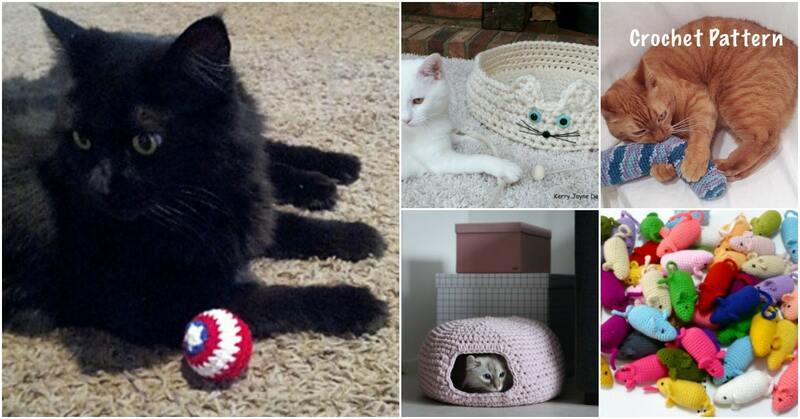 Your kitties need their own place to snooze and this crochet cat bed is perfect for giving them their own space. They’ll love the softness of the yarn and you’ll love how easy it is to crochet. You need to know basic stitches and this one may take a while depending on your skill level, but your cats will love you for it. Even a beginner can have it done in just a few hours and it beats paying more than $20 for a bed at Wal-Mart. You know how cats love to play with balls of yarn, right? Well, this one is all their own. You crochet their own really large ball and then maybe they’ll leave your yarn balls alone. This pattern is so easy and you only need to know the most basic crochet stitches. It’s a little over three inches in diameter when complete so it’s perfect for your bigger kitties who like bigger toys. Plus, you can have it completed in about an hour or so. him losing it while playing. It’s a pretty simple pattern even with the complicated looking design and filled with gorgeous rainbow colors. You’ll need to know a few stitches aside from the basic crochet stitch, but they’re not complicated stitches by any means. 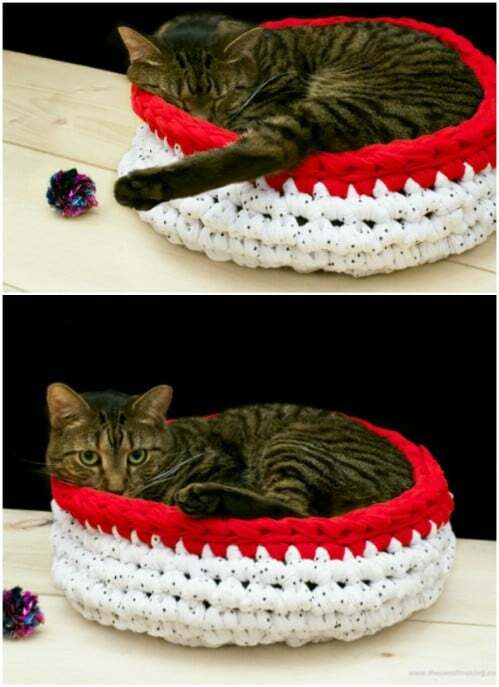 This cat bed is a bit different than a simple crochet. It’s a super bulky bed that your cat will love cuddling up in and it’s actually really simple to make. Instead of using yarn, you crochet this one with jersey t-shirt material that has been cut into strips. You also need some pretty big crochet hooks for this one. You can pick up old shirts at Goodwill or another thrift store for a dollar or so each, and you only need a couple to make this bed. This little cat ball has the shield of Captain America to keep him safe. 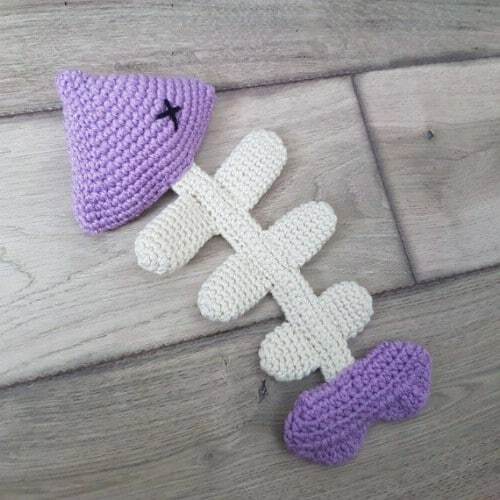 If you, or someone in your home, is a huge fan of the Avengers or just Captain America in general, this is the perfect cat toy for you to crochet. Plus, it’s a simple workup and won’t take you long at all to complete. You crochet the shield over a plastic cat ball and when it’s finished, it’s really sturdy so your cats aren’t likely to tear it up easily. This little bed is a bit different than others in that it expresses your cat’s own personality. It has a cat’s face right on the front. It’s whimsical and very comfy for your little kitties. The pattern is really simple to follow and you don’t need to know any complicated stitches. I found this little pattern on Etsy for around $4, which is still much cheaper than it would cost to buy a bed, especially an adorable bed like this with a cat’s face and ears! This kitty collar pattern is so simple and will cost you much less to make than those stiff, uncomfortable collars at pet stores. 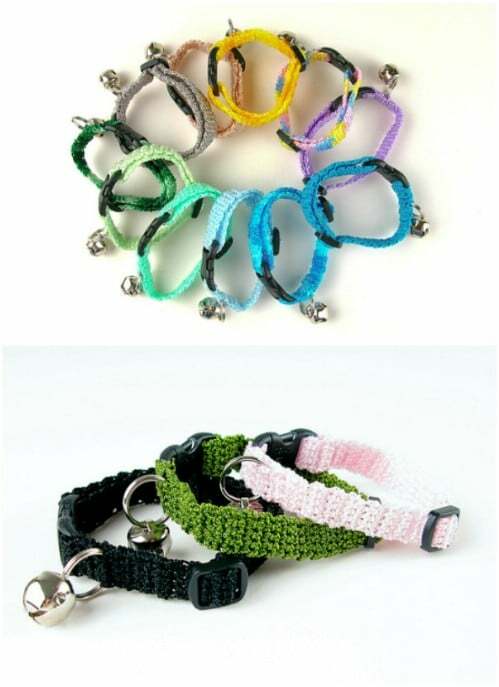 It uses the most basic crochet stitches and all you need aside from yarn is a fastener, which you can pick up at pet stores or hobby and craft shops. You can even add a little jingle bell to it so that you know where your kitty is at all times. 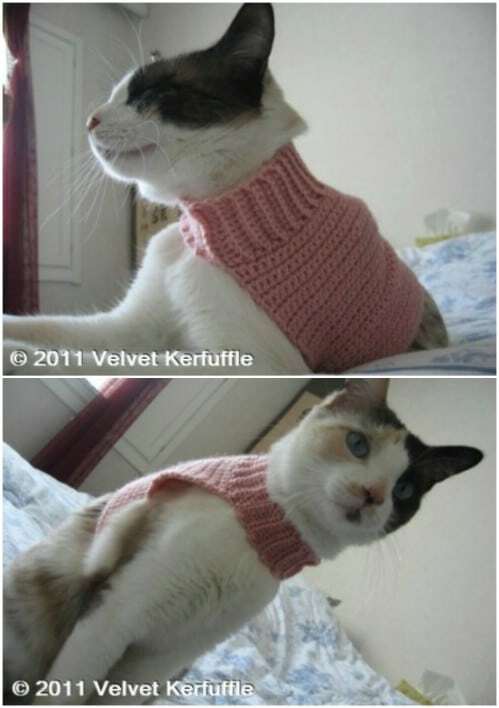 This is a really comfortable collar for cats and can be worked up in less than an hour. 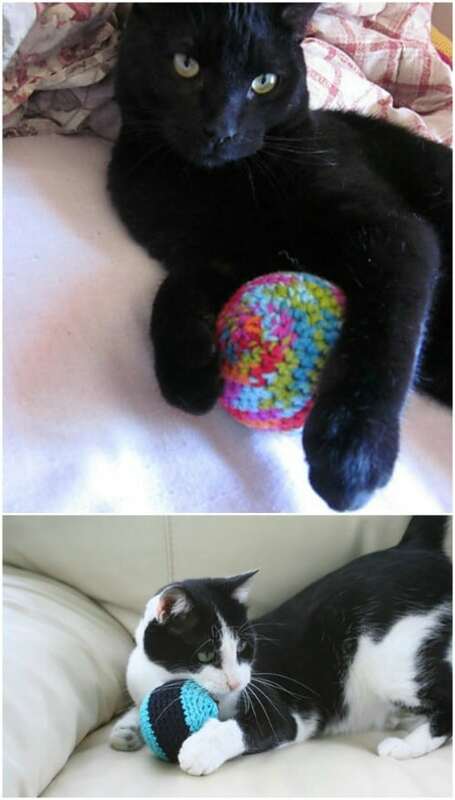 These cat balls are crocheted from t-shirt yarn and so very simple to make. 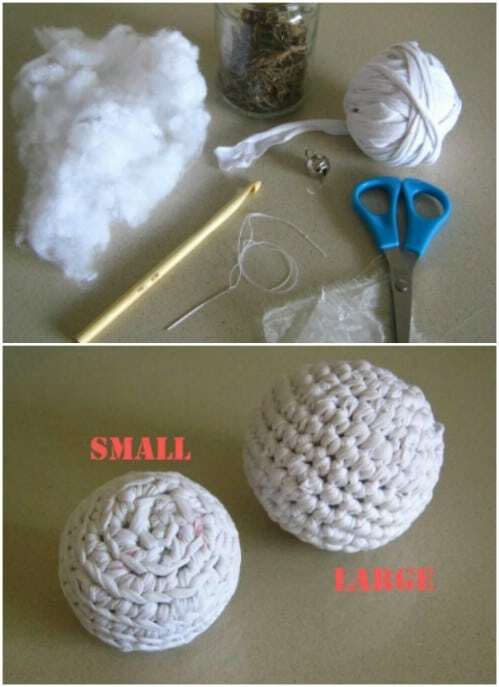 You only need one t-shirt to create a small ball or you can use a second if you want the ball to be larger. 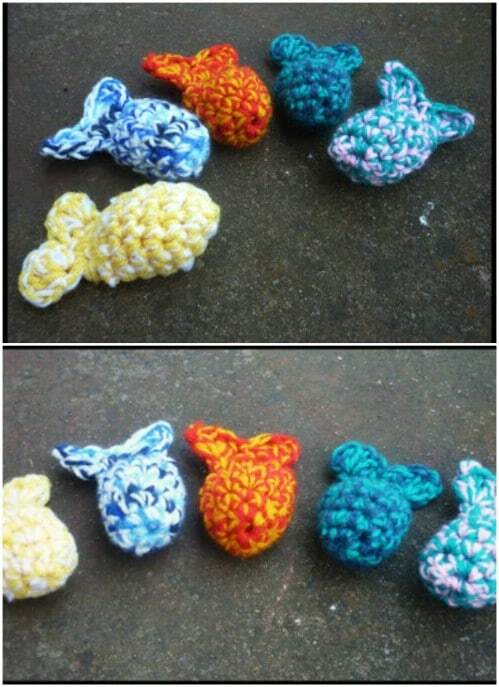 You fill a sachet with catnip, valerian or other herbs and then crochet the ball around it. Cats will love playing with these soft catnip filled balls and you’ll love how very easy they are to crochet. 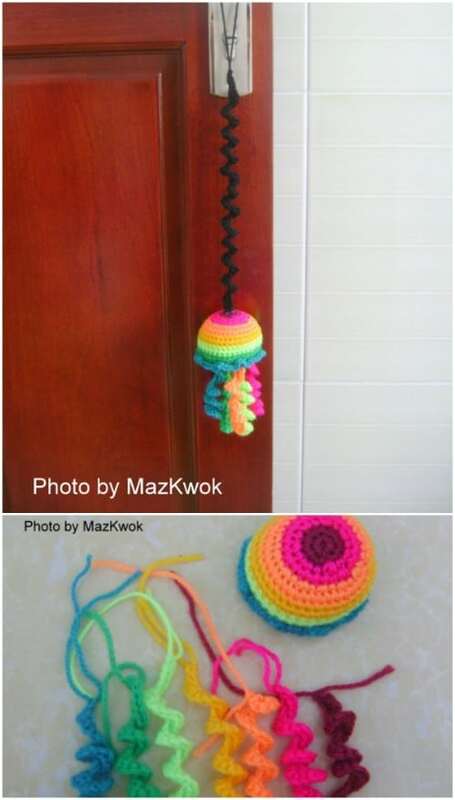 Here is another great bouncy toy that you can crochet in about an hour or less. It hangs from a doorknob and gives your little kitty hours of play time. It’s listed as an easy for beginner’s pattern, which means you can do this even if you’ve never crocheted before. You just need to know basic crochet stitches and have about an hour set aside to make it. Your cats will love playing with it as much as you love making it. Cats love fish – or at least they love watching the ones in my aquarium. To that end, they need little fish of their own so that they leave the real ones alone. This little fish toy can be worked up in less than an hour and it’s filled with catnip, so your little kitties will love it much more than they love those goldfish in a bowl. Here’s another fish for your kitties to play with, only this one is just the skeleton. It’s fun and really cute and so easy to crochet. The pattern is available on Etsy for less than $4 and although there is a bit of assembly required after you’ve crocheted all your pieces, it’s listed as an easy project for beginners and shouldn’t take you longer than an hour to put it all together. Plus, your cats are going to love playing with this whimsical toy. 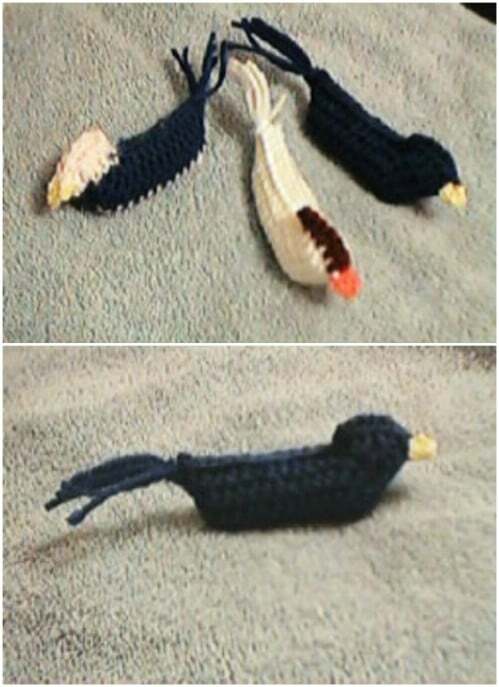 How about another fish toy? 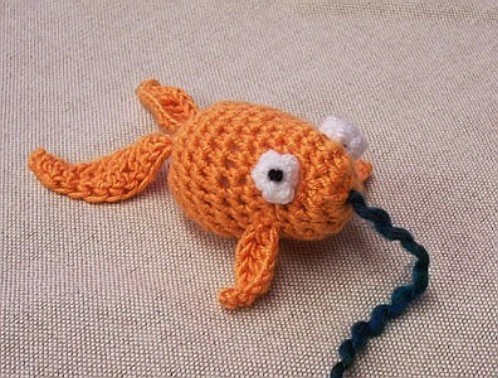 This little goldfish is just too adorable and he’s really easy to make. This is a level 2 easy project, which means you can do it even if you’ve never held a crochet hook in your life. He’s a small little fish, so he’s fast to work up and you don’t need to know any complicated crochet stitches to bring him into your kitty’s life. Just basic stitches and about an hour or less of time is all you need. 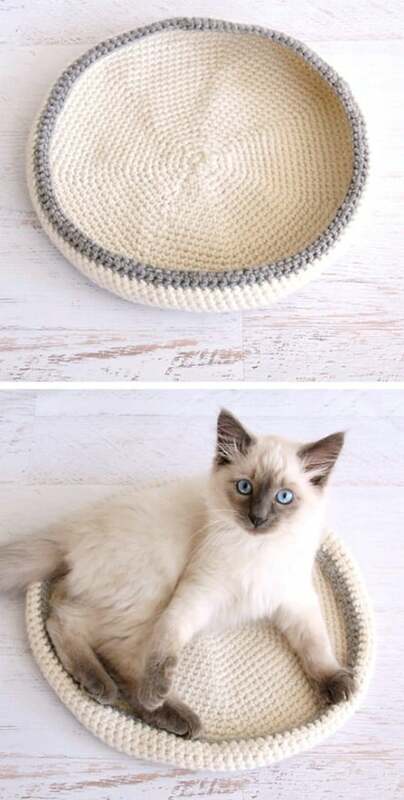 Your little furry feline may not take well to wearing a hat, but if he likes it, this is the perfect one for you to crochet. 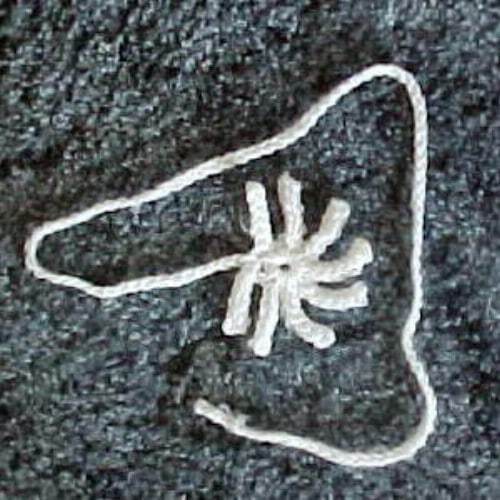 The pattern is really easy to understand and you only need to know the most basic stitches. This is too adorable and is a relatively small hat so it works up rather quickly. What a cute little way to show your kitty some love! This little chicken is so easy to crochet and he’s filled with catnip to keep your kitties happy. You roll up your catnip in batting and fold the edges in, rolling the batting into a tube shape which becomes the body. Then stuff the head with batting and add the catnip. The crocheting part is really easy and it should only take you about 10 minutes or so to assemble when it’s ready. If your cats don’t really like the cold – and most don’t – you can keep them warm and toasty with this adorable little banded sweater. It’s an easy project and it works up pretty quickly. This is a great gift for your kitty or for anyone who may be getting a new cat. Choose colors that match your favorite sports team or just your favorite shades. The big button at the collar keeps the sweater firmly in place. You can find so many wonderful ways to give your cats catnip and this stick is yet another one. It’s such a simple thing to crochet and works up in under an hour. You basically just crochet a tube that you will place your catnip – along with a holder of some sort – inside. 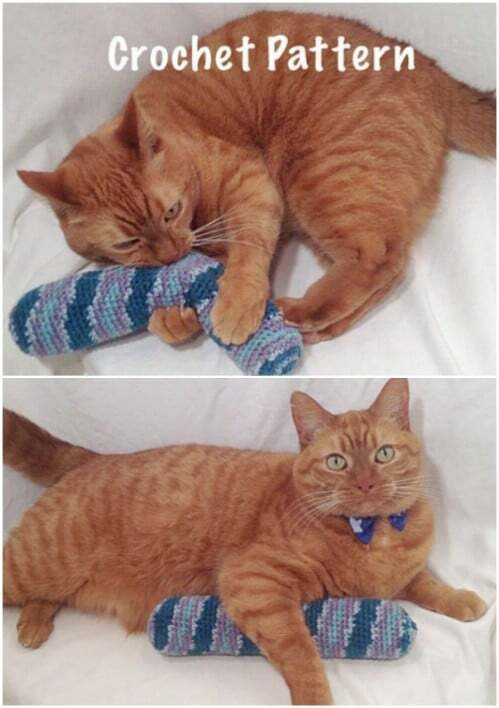 This pattern is available on Etsy for around $4 and comes with all the instructions you need to create this adorable little crocheted catnip stick. These little mini donuts are too adorable and they’re perfect for your kitties to play with because they’re soft. Plus, they don’t take you long to work up. This is another really simple pattern, even with the decorations and such. 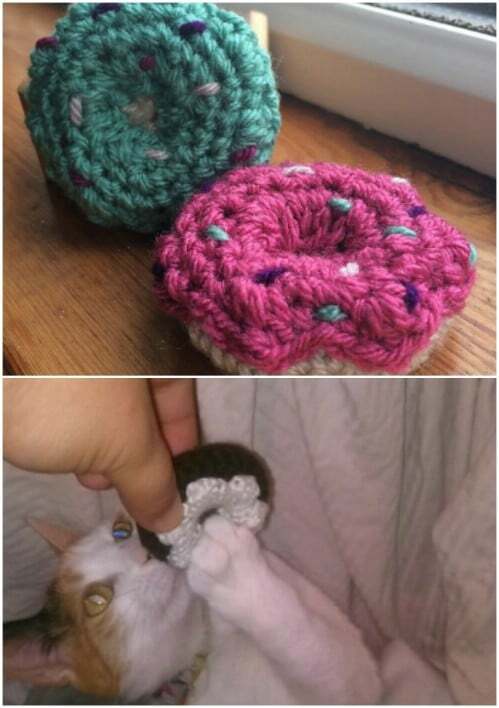 You can make these in an hour or less so if you have more than one cat, you have plenty of time to create a little donut for each one of them. it will keep him warm, not to mention adorable, during those colder days and nights. It’s not too hot, so it’s great for any time of the year. You can work this one up in about an hour or two, depending on your skill level and you don’t need to know any really complicated crochet stitches to make it. What do cats love more than fish? 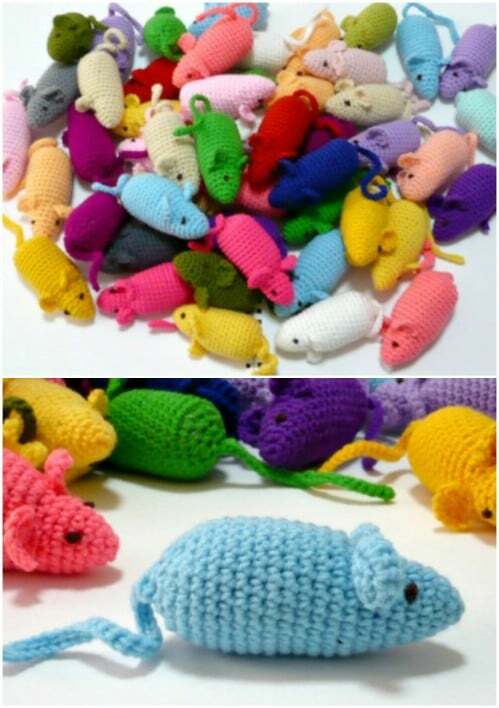 Mice, of course, which is why this little crocheted mouse with catnip is the perfect project for your little furry feline. You need to know basic crochet stitches plus chain stitch, which is relatively easy. You fill the little mouse with catnip to keep cats interested. 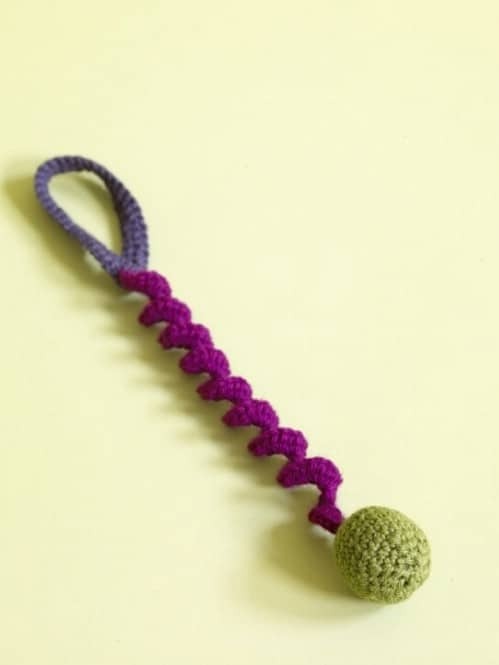 Overall, this is one of the simplest cat toys you can crochet and will certainly be your cat’s favorite. This little crocheted nest is so much more than just a bed. Cats like their privacy and this nest certainly gives it to them. It’s also a comfy bed so you may just lose them in here for several hours a day. The pattern is not terribly complicated and this actually works up much faster than you may think. 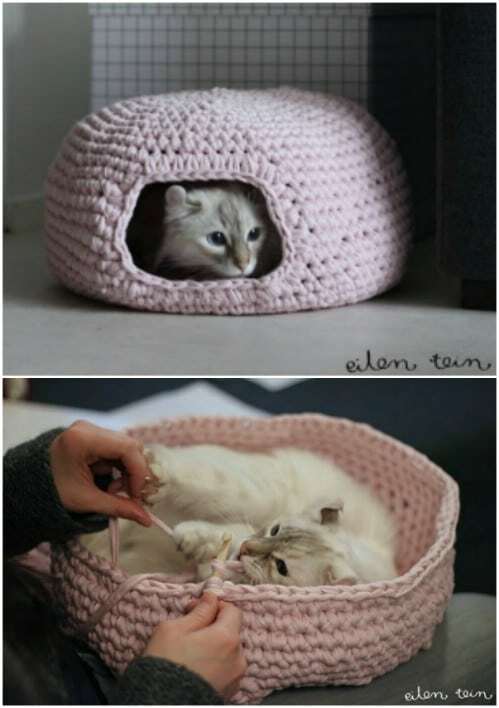 You use a larger crochet hook to make it, which creates a lovely little nesting area that is perfect when your kitty wants to hide away from the world. This little toy is sure to please with its overall shape and those little swiggly pieces coming down from it. It looks like an octopus and has tentacles that are sure to keep your kitty entertained for hours on end. This is also a really easy project to crochet. 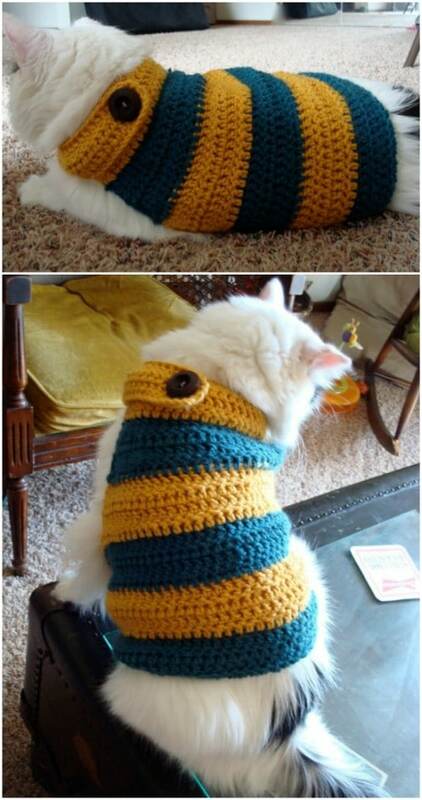 You can even adjust the pattern to make a smaller version if you want – for smaller kitties. 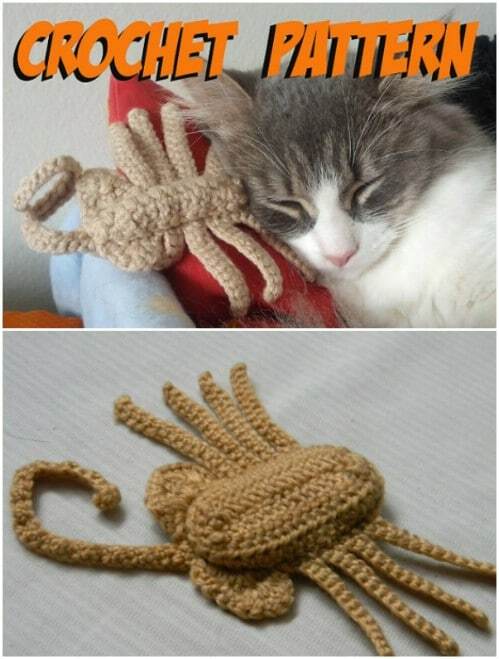 I don’t like spiders as a general rule, but this little cat toy is really adorable. This may just be the easiest toy on the list to crochet and you can work this one up in about 15 minutes or so. It has “legs” that the cat will want to play with and overall, this is one of the simplest projects that takes much less yarn than many others. It’s also the perfect project if you want to practice your basic crochet stitch. Everybody loves tacos, right? 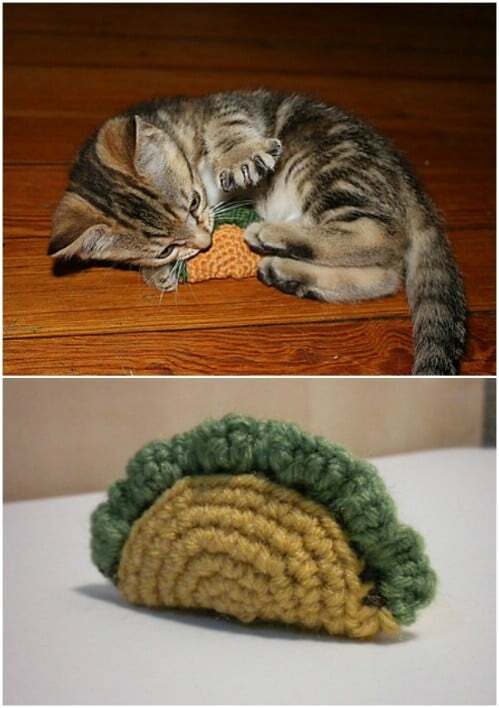 If even your cat is a fan of tacos, you can make him his very own little crocheted taco toy. This is the perfect toy for hiding catnip and is a really easy pattern to follow. You can work this up in about an hour even if this is the first thing you have ever crocheted. It’s pretty colorful and cats will love the shape – I mean, doesn’t everyone love the shape of tacos? These are Great! I just learned crochet and have made a scarf and two amigurumis. So excited and pleased with my accomplishments! These patterns are great and nearly all seem beginner friendly! Thank you for compiling this list!